An art historian, Beth Gersh-Nesic, invited me to be a guest speaker at her class on contemporary art at Purchase College, State University of New York. Given the freedom to introduce my work to the students in any way I deemed appropriate/effective, I decided to present two performances: one scripted and one interactive. 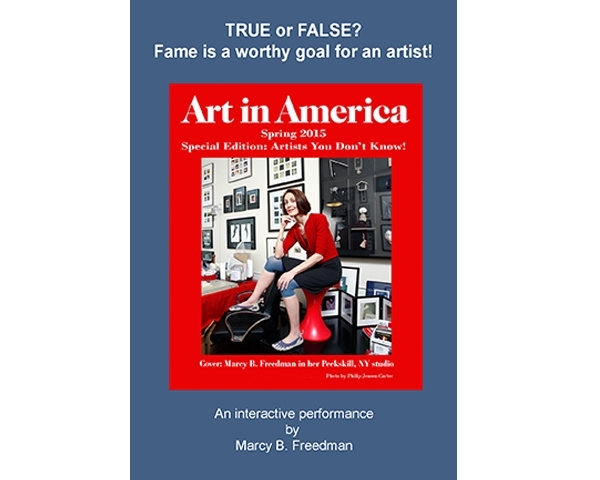 The interactive performance — True or False? Fame is a worthy goal for an artist. — proved to be a good choice! For a period of almost three hours, I sat and chatted with students (one at a time) from the class. These men and women ranged in age from early twenties to well over fifty. I was surprised and pleased to discover that most students really thought deeply about the issue that I raised. Indeed, I had arrived with strong convictions about my own position in the matter at hand, but I was forced — in a few cases — to re-evaluate my ideas when confronted by reasonable points made by a few of the students. In the end, I think that most of the interactions were thought-provoking for the participants and for me!